The discovery lab is a place for your own discoveries. 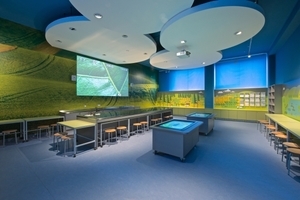 A room equipped with audio-visual and other kinds of technology for lectures and research. It’s mission is to offer all curious visitors the opportunity to “discover” new knowledge and information on our themed exhibitions and agricultural spheres represented at the National Museum of Agriculture. The discovery lab is also a place where educational and tutoring programmes and even lectures are held, whether for schools or themed for the public during museum events. You will find the Discovery Lab on the second floor of the Prague building of the National Museum of Agriculture behind the Water in the Landscape exhibition.